Postcard from 1910, written by parish priest Giovanni Battista Lenzi, with an artist’s rendition of the parish church of Santa Croce del Bleggio. Click image to see it larger. Genealogist Lynn Serafinn tells what you can learn from church records, the role of the parish in Trentini life, and where to look for your ancestors’ records. 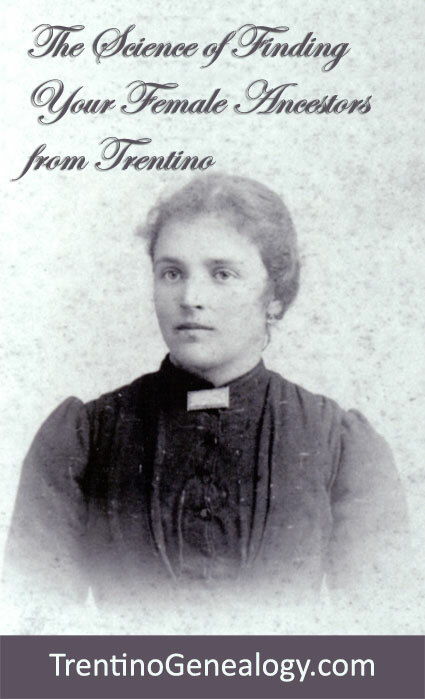 Perhaps the biggest question people have when they want to create their family tree is, ‘How do I START?’ The task of researching your Trentino family history can seem daunting, especially if your Trentini ancestor is more than a generation away from you, i.e. a grandparent or great-grandparent. In my opinion, the best starting point is to look at parish records. 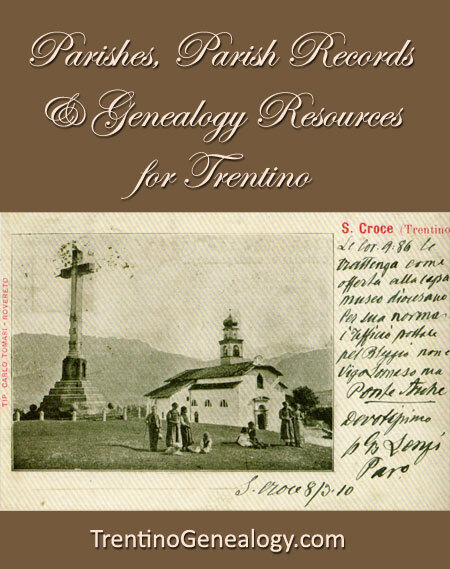 I’ll be talking a lot about the ‘how to’ of parish records in later articles, but today I want to lay the groundwork by explaining what they are, how parishes operated in our ancestors’ lives, and what available resources there are for the parish records of the Catholic Archdiocese of Trento (which covers all of the province of Trentino). What Are Parish Records and When Did They Start? Parish records (registri parrocchiali, in Italian) are books kept by the parish priests to record important events that took place in their parish, including (but not limited to) the ‘vital’ records of baptisms, marriages and deaths of all their parishioners. Some church records include confirmations, first communions and church census records, but these are generally only accessible if you go directly to the parish itself and view the original records. The keeping of parish records was first mandated by the Catholic Church in 1563, at the Council of Trent (Trento), when all Catholic churches were directed to keep records of all baptisms, marriages and deaths within their parish. Some parishes, including Santa Croce del Bleggio where the majority of my Trentini ancestors lived at that time, was one of the early conformists to this new regulation, and you will see baptisms and marriages appearing as early as 1565. Many parishes were late to adopt the practice, although most kept records of births and marriages by 1595. In many parishes, the regular practice of keeping death records appeared slightly later. Bearing in mind that civil records in Italy began around the time of the Napoleonic wars in the early 1800s (and, even more significantly, Trentino has only been part of Italy since the end of the First World War), Catholic parish records are vital to genealogical research in Trentino. The more I research my ancestors, the more I come to respect the role of the parish in their everyday lives. A parish was (and still is) more than the place to go to church. This church was a portal of all rites of passage – coming into the world, unifying for the purpose of procreation and, ultimately, leaving the world. It was the place where people came together on a regular basis, and where everyone knew everyone else. It was also where families in need could find support. In fact, a progressive, rural cooperative movement – aimed at helping poor, farming families – was established in 1890 by the priest don Lorenzo Guetti (of Vigo Lomaso), assisted by don Giovanni Battista Lenzi (of Santa Croce). Church records are not merely repositories of your ancestors’ vital information. Within them, you can also find evidence of friendships and long-standing alliances between families, as well as clues as to the occupations and reputations of various individuals within the community. Digging really deeply into them, you can see the heartache of loss, and both the fragility and the tenacity of human existence. Some parish records can even provide us with a microcosm of contemporary community life, and the concerns of its people. I read some heart-rending accounts penned by don Lenzi during the first decades of the 20th Century, where he shared his feelings on the tragedy of the First World War and his reflections on the trend of mass immigration to the Americas. I even read an account about a devastating fire that took place in 1916 in the house of my great-grandfather. Parishes and Life Events – Where Did They Take Place? Marriages normally took place in the parish church of the bride, or sometimes a smaller church in the bride’s frazione (village). 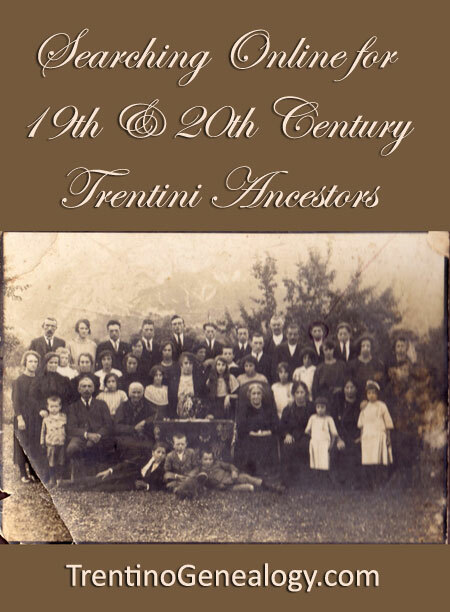 As the vast majority of marriages took place between two people from the same parish (and sometimes even from the same frazione), you can often trace many generations of your Trentini ancestors within a single parish. If you cannot locate a marriage record for a couple, it is often an indication that the wife came from a different parish. In such a case, you might have luck looking at marriages that took place in parishes nearby that of the husband. After a couple married, they normally went to live in the husband’s frazione of origin. This means any baptismal records of children born from that marriage would be born in their father’s parish. The fact that wives tended to move to their husband’s frazione means that over the generations, each frazione came to be associated with specific families. For example, if you say the surnames ‘Crosina’ or ‘Farina’ in the parish of Santa Croce del Bleggio where my ancestors came from, 99% of the time they will have been born in the frazione of Balbido. Knowing these kinds of trends can really expedite your research, especially because some priests organised baptismal records according to the frazione. Burials, of course, would be registered in the parish in which the person was living at the time of death. Thus, a woman born in one parish will most likely have been buried in her husband’s parish. There are always exceptions to these patterns. Sometimes a bride is the last surviving child from her parents’ marriage, or is the eldest daughter, with no brothers. In such cases (and especially if the groom came from a family where there were many sons), the groom would likely move into the home of the bride and the couple would take ownership of the father’s property upon his demise. Occasionally, if an unmarried man married a widowed woman, he might move into the home in which she had lived with her late husband. Because such exceptions sometimes arise, if you are having difficulty finding the baptismal records for the children of this couple in the village of the father, the most likely place to look would be the village of origin of the wife. Another exception is when the husband is a person of import – a notary or judge, for example. Such men might be assigned to an official post in another parish. In such cases, the whole family would move to this new parish, which might have no ancestral connection to either the husband or the wife. For example, my grandmother’s line, the Onorati, had several notaries in the family, going back many centuries. Although their ancestral village is in the frazione of Bono (Santa Croce del Bleggio parish), a few Onorati families lived in other parishes for short periods of time, when the heads of the families were posted at castles like Stenico (Tavodo parish) and Castel Campo (Vigo Lomaso parish). Thus, if you want to find the records for children born during those years, they may be in the parish of origin OR in the ‘adopted’ parish. Sometimes, you will find the records in both parishes. On the other hand, if you’re unlucky, they might be missing in both. SIDE NOTE: All of these habits were the norm in Trentino prior to WW1. While these trends still exist today, the way many people live, marry and work has changed significantly over the past century, as people have become more mobile. Parishes are not ‘fixed in stone’ entities. As populations rise and fall, some parishes will merge together, while others will split apart. Some very tiny frazioni have shifted around a lot over the centuries, appearing in one set of parish records for a period of time, and then in another later on. One example is the frazione of Saone, which was originally part of the Bleggio parish, but later became a parish of its own. Another is the frazione of Favrio in the current-day parish of Ragoli, the records of which over the centuries were constantly shifting back and forth between the parish of Ragoli and Thione. As a result, there are significant gaps in the early church records for these villages. Sometimes entire decades are missing. If you cannot find the records you are looking for, don’t give up until you have exhausted all the most likely possibilities. Look on a map and see which parishes border your ancestors’ usual parish of origin, and check those records before resigning yourself to the fact they may no longer exist (if they ever did). For three years I believed I would never find the marriage record for my 7x Serafini great-grandparents. But a few months ago, I ‘stumbled’ upon the very record (from 1642) when I was searching for something else in a nearby parish. 1642 marriage record of Antonio Serafini (son of Serafino) and Catharina Floriani, both of Favrio, in Ragoli. This record was found in the THIONE parish records, although the baptismal records for their children were found in the RAGOLI parish records. Where Can I Find and Search Trentini Parish Records? While I work regularly with all three of these resources, my favourite is the Archives in Trento. Of course, utilising the Archives of the Archdiocese requires physically going to Trento (as these resources are not available online). This is impractical for many, especially those who live in North America and/or don’t speak Italian. Even if you do make the trip, knowing how to find and understand what you’re looking for is not something easily done if you’re just starting out in your genealogical quest. After that, I’ll be sharing my tips on finding and using LDS microfilms, working with the Trento Archives, and ways you can take your research beyond parish records. I hope you’ll subscribe to this blog so you can read all future articles on this site. Desktop viewers can subscribe using the form at the right side at the top of your screen. If you are viewing on a mobile device and cannot see the form, you can subscribe by sending a blank email to trentinogenealogy@getresponse.net. Also, if you’d like to talk to me about researching your family history, you are most welcome to drop me a line via the contact form on this site. Lastly, I invite you to visit our extended family tree on Ancestry, which has many thousands of Trentini, mostly from the Giudicarie Valley, from the 1400s to the present day. You can find that tree at https://www.ancestry.com/family-tree/tree/110809816/family. Through extensive research, Lynn has already linked together thousands of Trentini in an extended family tree. 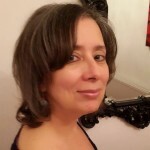 Her current research project is called ‘One Tree, One Family, One Humanity,’ the goal of which is create a genealogical ‘map’ of everyone either born in Bleggio, or whose ancestors came from there, from the 1400s to the current era, to serve as a visual and spiritual reminder of how we are all fundamentally connected. Elisa Serafini (b. 1880) of Duvredo, one of many distant cousins. While she died young, her daughter Angelina Painelli lived to be 100 years old. Genealogist Lynn Serafinn discusses the challenges of researching women in parish records, and how to find your great-grandmothers through the centuries. A note before we begin: Although this article is about finding your female ancestors from Trentino, many of the research strategies discussed can be applied to finding your female (and male) ancestors from anywhere parish records are used to record births, marriages and deaths. 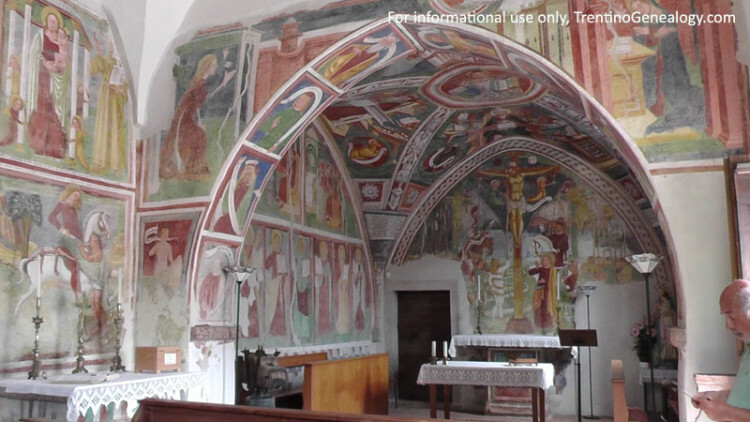 If you are not yet familiar with how to find and access parish records from Trentino, be sure to subscribe to this blog, as I will discuss that topic in a later article. Many of us strongly identify with our surname. Thus, many people will begin their genealogical journey by tracing the lineage of male ancestors with the same last name. However, when constructing a surname lineage, results will be limited. Even if you were to trace your patrilineal surname lineage back to your 11x great-grandparents* (which might take you back to the second half of the 1500s, when parish records in Trentino began), your tree would have a total of only 27 people: you, your two parents, your two paternal grandparents, your two paternal great-grandparents, and so on. *SIDENOTE: ‘11x great-grandparents’ is shorthand for great-great-great-great-great-great-great-great-great- great-great-grandparents’ (i.e. the word ‘great’ eleven times). While constructing a surname family tree is a natural part of exploring our identity, genealogically speaking, it is only a tiny fraction of who you really are. The real ‘juice’ of genealogy is when you start to explore the rich and diverse heritage you have received from your many, many great-grandmothers. After all, 50% of your DNA is from the women in your family tree, and each of those women has a mother and a father. If you do some number crunching, if you trace your complete ancestry back to your 11x great-grandparents, you could theoretically have as many as** 8,192 great-grandparents, half of whom (4,096) are women. Even if you are not 100% Trentini, and you have only one Trentini grandparent, you could still have as many as** 1,024 female Trentini ancestors who are probably listed somewhere in the parish records. **SIDENOTE: I say ‘as many as’ because that’s the highest number you get if you multiply each successive generation by two. However, the number is most likely to be somewhat smaller, as Trentini families typically intermarried. For example, let’s say your 10x great-grandparents had two sons who married and had children. Then, many years later, the 5x great-grandson of the first son married the 5x great-granddaughter of the second son. Many years later, you became a descendent of that marriage between the 5x great-grandson and the 5x great-granddaughter. That means your 10x great-grandparents are your ancestors via two different branches of the family. This kind of intermarriage will ‘collapse’ your family tree at various points, meaning it will reduce the number of ancestors you actually have. I’ll talk about this in more detail in a future article. The challenge in Trentino, and I imagine in other parts of the world as well, is that women’s names were not always documented as thoroughly as they are today. From my experience, this is generally what you can expect to see in parish records. 1500s – The name of the mother of the child is often completely missing. The name of the father is always given, and the name of the father’s father is frequently given. The father’s frazione (village) of origin is always given. 1600s – The first name of the mother is usually given, but not her surname (remember, Trentini women maintain their father’s surname throughout life). As before, the name of the father is always given, the name of the father’s father is usually given, and the father’s frazione of origin is always given. 6 Aug 1628. 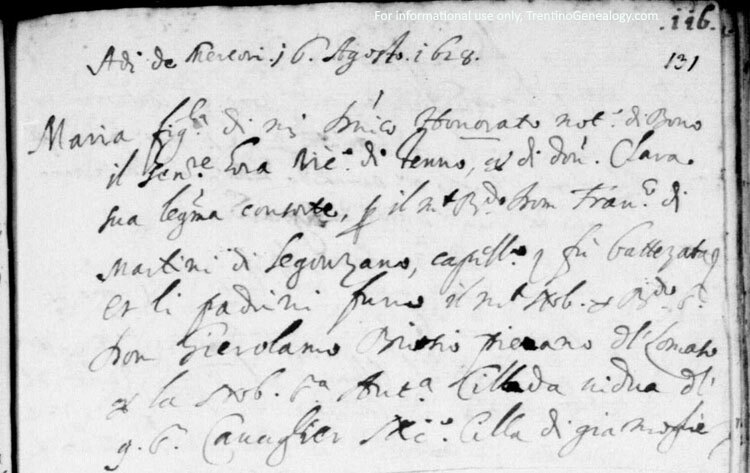 Baptismal record of Maria Onorati, daughter of Domenico (a notary) of Bono and his wife Chiara (spelled ‘Clara’ here, last word on the second line). Note that Chiara’s surname (Burratti) is not given in the record. Maria was my 7x great-grandmother. 1700s – It gradually becomes the practice over the century to include the full name of the mother’s father (hence, you know her surname), and also her frazione of origin, especially if it is different from the husband’s. As before, the name of the father, the father’s father, and the father’s frazione of origin are given. Early 1800s – After 1806, printed templates are used for the parish records, with specific columns for the information. This makes the records far more detailed and consistent. From this point, you will normally find the surnames, fathers’ names and frazione of both parents of a child, but not the names of the mothers of the parents. Sometimes you might see a cross next to a child’s name, indicating they died not long after their birth. Late 1800s into 1900s – From about 1880, you will start to see the names of both parents, as well as the full names and village of origin of both sets of grandparents of the child. Some priests will also list the name of the midwives, and make a note if the child is the couple’s firstborn. As you approach the 20th century, some priests will also go BACK to baptismal records many years later, and enter the person’s marriage date and/or death date somewhere on the baptismal record. If the person emigrated abroad (increasingly common), they might make a note of that date as well. In all marriage records, you will find the full name and village of origin of the fathers of both the bride and the groom. As in the case with baptismal records, you will start to see the names of the mothers of the bride and groom appear in the records towards the latter part of the 1800s, as well as the ages (and sometimes date of birth) of the bride and groom. Example of a detailed marriage record from 1815. In all cases, the names of both sets of parents are given, as well as the ages of the bride and groom. The first two entries also include the date of birth of the brides, and whether they are widowed or single. Entry 3 (29 May 1815) is of Vigilio Aloisio Devilli (widowed, age 40) and Domenica Aloisia Caliari (single, age 36). There is a note that says they were given a special dispensation for 3rd degree consanguinity (further investigation gave me the evidence to show they were 3rd cousins). Prior to the late 1800s, the death record for an unmarried woman typically designates her as the daughter of her father, while that of a married woman will designate her as the wife (or widow) of her husband. Sometimes, if the deceased is a young child, you might see the name of the mother as well as the father. Death records for men tend to provide even less information, as they designate the man as the son of his father, and almost never mention the wife. Thus, unless the priest has written down the age of the person at the time of death (and you already have a good idea of when he/she was born), it can be difficult to know whether you’ve found the record you’re looking for. As in the baptismal records, from the latter part of the 19th century, you will start to see more complete details in the records of both men and women, including the names of their parents and spouse, and the dates of birth and marriage. Be aware, also, that some parishes started keeping death records much later than they started recording baptisms and marriages. Given these factors, finding your female ancestors further back than the middle of the 19th century can be significantly more challenging than finding your male ancestors (which can be challenging enough!). Still, finding your female ancestors can be done if you take a systematic approach in your research. 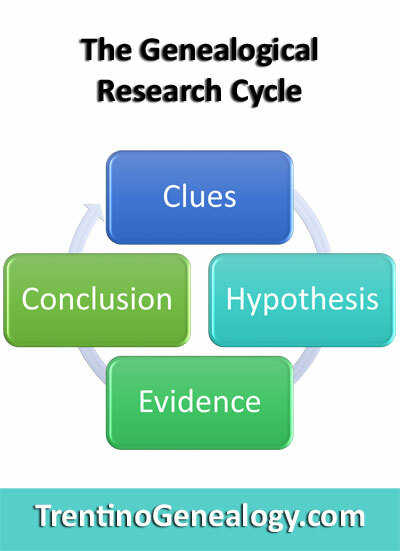 Once you have drawn conclusions, the cycle starts all over again, as you begin to look for clues to answer the next batch of questions that will inevitably arise. Let’s take a look at how to apply that system to finding your female ancestors. Looking for clues involves lateral thinking. This means you need to expand your scope of research to include not only your direct ancestors, but also their siblings. There are many important reasons for this. First, the very clue you seek may be in the birth or marriage record of a sibling, and not in the record of your direct ancestor. Second, as I discussed in my previous article, ‘How Much Do You Really Know About Your Ancestors’ Names?’, families tended to name their children after other members of the family, including elders and recently deceased siblings. Thus, the only way to make sure you have found the correct person – and not a dead sibling, cousin or someone unrelated – is to construct the whole family as completely as possible. Once you have the family constructed, you can make some hypotheses to help you locate evidence about your female ancestor. For example, let’s say you know the name of your 5x great-grandfather in the 1700s, and you are trying to find out more about his mother, your 6x great-grandmother. You’ve managed to find the baptismal record of your 5x great-grandfather, which gives the full name of his father, but only the first name of his mother. In this case, you would need to look for all of your 5x great-grandfather’s brothers and sisters. Go backwards and forwards, continuously looking for children of the same father, where the father is married to a woman with the first name. Statistically, MOST of the time, there will be only one couple with that name during those years. Occasionally, you will encounter the genealogist’s nightmare: two men with the same first/last name married to two women with the same first name, but I’ll talk about how to get around scenarios like that in a later article. For now, let’s assume there is only one possible couple who meet the criteria of your 6x great-grandparents. Typically, children were born continuously anywhere between one and three years apart. 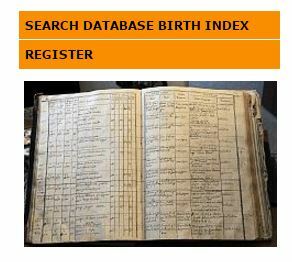 Even those who died soon after birth will be listed in the baptismal records, as they were often been baptised within hours of having been delivered. In fact, when you see two children born only about a year apart, it can sometimes be an indication that the first of these children died in early infancy (as, biologically, a woman cannot ordinarily become pregnant again until she has finished nursing the previous child). If you stop seeing children after five or more years in either direction, it is likely that you’ve reached the beginning/end of the childbirths for that couple. SIDENOTE: The ‘gap’ theory is NOT always applicable to families after the 1880s. From that time, many men were spending extended periods of time working in the coal mines in the United States, coming home to their families every few years. In those cases, you might see big gaps (sometimes as much as eight years) between the births of children. One example is Elisa Serafini in the photo at the top of this article. Her two children, Angelina and Costante Painelli, were born 7 years apart because her husband Ambrogio was working in the mines in Pennsylvania between 1904 – 1909. Family of Ambrogio Painelli and Elisabetta (Elisa) Serafini from the early 20th century. The 7-year gap between their children flagged up the probability that Ambrogio had spent some time working in the coal mines of the US. This clue led me to find him in an immigration document in 1904, when he was on the way to Pennsylvania. I have not found any other children for them. I knew Ambrogio lived a long life, I had a photo of him at an advanced age, and a cousin of his later confirmed his date of death as 1961. This led me to assume Elisa died as a young woman. My next step will be to look for evidence of her death in the parish records. ON AVERAGE, most Trentini couples had their first child about a year after they married. So, if you know the birth of the first child was in February 1707, you can form a hypothesis that the couple married sometime around 1705 or 1706. ON AVERAGE, most Trentini women tended to be about 21 years old at the time of their first marriage, with a more general norm of anywhere between 18 and 24. Younger than 18 was uncommon. Older than 24 was possible if there were a lot of daughters of marriageable age in her family, or she was widowed and in her second marriage. There was no such thing as divorce in the Catholic families during this period. Thus, if you have formed a hypothesis for her marriage year, you can also form an estimate for her year of birth. In the above example, if your 6x great-grandparents were probably married around 1705, your 6x great-grandmother was probably born between 1681 and 1687, with the most likely date around 1684-5. The birth date of the LAST child can also tell you a lot about the dates of birth and/or death of your 6x great-grandmother. Before the late 19th century, when the rate of infant mortality was heart-wrenchingly high, it was the norm for women to give birth to 10, 12, 14 or even 18 children. If your 6x great-grandparents had such a ‘normal’ sized family, you can narrow down your 6x great-grandmother’s birth date by looking at the date of birth of the last child. Statistically, it is reasonable to hypothesise she was between 43 and 45 years old when that child was born. If you balance this against the estimate you made when you looked at her probable date of marriage, you might be able to narrow down her birth date to within a year or two. For example, here’s a screenshot of my 4x great-grandparents, which I shared in the previous article. Margherita Giuliani gave birth to 14 children, born between July 1805 and May 1827. From this information alone, I can hypothesise that she probably married in 1803 or 1804 (up to 19 months before the birth of her first child), and that she was born around 1783 or 1784 (as she would have been 43 or 44 when her last child was born). The parish records show that she indeed married in September 1803, and was born in August 1784. The SIZE of the family can also give important clues. Before the middle of the 1800s, if there are fewer than eight children in the family, it could be an indication of the death of either the husband or the wife. If their children were still young, widowed men and women tended to remarry within a couple years of their spouse’s death. So, if you see a small family followed by a gap in the birth records, and then you start seeing a man with the same name having children with a different woman, it could indicate that the man remarried (of course, it could be referring to a different man altogether). If you suspect your 6x great-grandfather remarried, you can estimate the year of death of your 6x great-grandmother by looking at the date of birth of her last child, and the date of birth of her widowed husband’s first child by the new marriage. At this point, I recommend you enter these estimates into your family tree. I do NOT suggest you put them as fixed dates; rather, use descriptors ‘about’, ‘before’, ‘after’ or (in some cases when I am less sure of the range), ‘between’. That way, you have a guide to know where to start looking to find your evidence. Once you have these clues, the first thing you need to do is find the MARRIAGE record. Go the marriage records for your ancestors’ parish and look within the estimated time period to find a marriage between a man with your 6x great-grandfather’s name and a woman with the first name of his children’s mother. This is important because the marriage record is the ONLY document where you know for sure you will find the full name of your 6x great-grandmother’s father and, importantly, her surname. Now you can change your estimated marriage year to an exact date. Here’s something else VERY important to do at this stage: be sure you record the VILLAGE (frazione) of origin of your 6x great-grandmother’s family. Sometimes, knowing the frazione is the only way you can FIND your ancestors, or distinguish them from another family of the same name. For example, in the parish of Bleggio, there are two distinct branches of the now extinct ‘Pellegrinati’ family. One lived in Bivedo and the other lived in Duvredo. Many of them had the same first names. If you inadvertently identify someone as your ancestor from the wrong frazione, you could end up going down entirely the wrong path and waste months of research time. Armed with all this information, you can then go back to the baptismal records and look for your 6x great-grandmother, daughter of the man you now know is your 7x great-grandfather, born during the estimated time period for her birth in the frazione you found in the marriage record. When you find someone who seems like a likely candidate, go through all the records in the same frazione before/after her for about 10 years. Look for her siblings and keep a record of all of them. If you’re lucky, you’ll also discover their mother’s (your 7x great-grandmother’s) first name. Make sure there isn’t ANOTHER child with the same name from the same couple who might have been born a few years later, lest you enter the wrong information for your 6x great-grandmother. TIP: Take a moment to review the things we looked at in the previous two articles, regarding sopranome, spelling variations and middle names. Remember: your 6x great-grandmother might be referred to by her middle name in her marriage record, and both her surname and first/middle names might be spelled differently in the baptismal record. Once you have exhausted all the possibilities using this method, you are (hopefully) ready to draw the conclusion that you have found the woman you are looking for. Lastly, if your hypotheses include an estimated death date, you can look for the record in the death records. If the record identifies her husband or father, and/or gives her age at the time of death (which is often rounded-off, and rarely precise), you know you have the right woman. After you’ve done this for one generation, you’re ready to go back to the beginning of this process and work through it again to locate your 7x great-grandmothers (there are as many as 512 of them! ), and continue back as far back as you can go. What Can You Do When a Mother Isn’t Mentioned at All in a Birth Record? As I said earlier, in many of the baptismal records from the 1500s, the mother’s first name isn’t mentioned at all. However, if there is more than one man with the same name during the same period, chances are the records will identify one of these men as ‘the son of so-and-so’. In some cases, the priest might notate his sopranome (see my previous article about Trentini surnames). This information can also help you construct family groups of siblings, even if you don’t yet know the names of the mother (or mothers) for these children. If you’re lucky, all the children will be from a single couple. If that’s the case, you can probably find their marriage record fairly easily using the method we’ve already discussed. But sometimes, due to the proximity of births, it becomes obvious you are looking at two different couples. Solving those kinds of riddles can require much closer scrutiny of the records, something I’ll talk about more in future articles. I hope this article has helped give you some ideas about how to start identifying some of the more elusive women who make up your genetic blueprint. If you found it useful, please subscribe to this blog so you can receive future articles. Desktop viewers can subscribe using the form at the right side at the top of your screen. If you are viewing on a mobile device and cannot see the form, you can subscribe by sending a blank email to trentinogenealogy@getresponse.net. As mentioned at the beginning of this article, I am aware that some of you reading this might not know much (or anything) about parish records. For starters, WHICH parish records do you need? How do you obtain copies of them, and how can you understand them? We’ll be looking at that in the next article on the Trentino Genealogy blog. Later, we’ll also be looking at some ways to ‘think outside the box’ to find your ancestors, such as how looking at the godparents of your ancestors, and what you can learn when you see your ancestors showing up as godparents of other people’s children. Until then, I always welcome your thoughts, comments OR questions, so please feel free to share them in the comments box at the bottom of this article. And if your family are from Bleggio and you’re looking for help with your Trentini family tree, you are most welcome to drop me a line via the contact form on this site. C. 1909. Anna Corona Onorati and her sister Rustica Fausta Onorati of Bono, Santa Croce del Bleggio. Rustica hated her first name, so she changed it to ‘Lena’ when she grew up. Few family members knew her actual birth name. Genealogist Lynn Serafinn talks about how our ancestors named their children, and gives tips for making sense of names in their often-confusing parish records. Last time, we took a whirlwind tour around the many idiosyncrasies of the surnames of Trentino. I really just scratched the surface in that article, aiming simply to provide some rules of thumb when researching Trentini family names. Now, as promised at the end of that article, we’re now going to take a look at our ancestors’ FIRST and MIDDLE names. We’ll be looking at how our ancestors’ names changed when they migrated across the ocean, how and why parents chose names for their children, and crucial things to remember when working with old parish records (1500s – 1800s). SIDENOTE: While I will be referring to my own research (with specific examples from Bleggio in Val Giudicarie), the basic principles I will share here are useful for ANYONE constructing their family history within countries that utilise parish records to record baptisms, marriages and deaths. Most of you reading this probably have a family member who changed his/her first name after leaving Trentino for the Americas. If your grandfather was known as ‘Joe’ in America, chances are his birth name was the Italian equivalent, Giuseppe. Antonio would become Anthony or Tony, and Giovanni would become John. 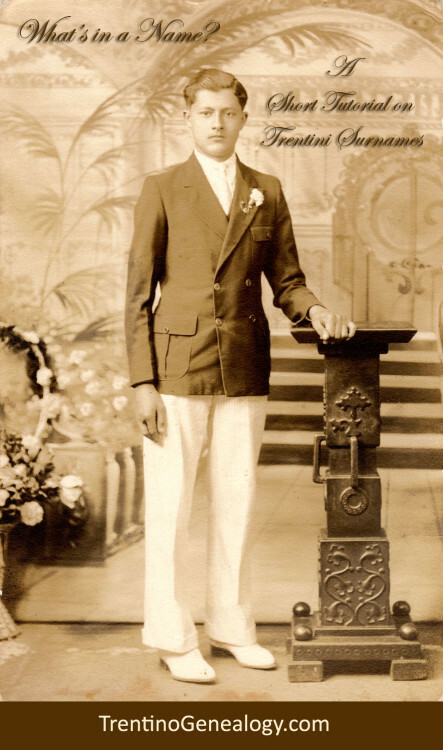 In my family, my grandfather was born Luigi, but he changed it to the English equivalent ‘Louis’ about ten years after he migrated (he also changed our surname from Serafini to Serafinn, as I discussed in the previous article). While many first names were easily translatable into English, some names had no real English equivalent. When that was the case, people often changed their name to something that sounded like their Italian name, rather than a translation of it. That means your Uncle Ned and Auntie Mabel might actually have been Zio Nerino and Zia Amabile. There are also cases where a person’s name bears hardly any resemblance to the original at all. For example, my father’s first name at birth was ‘Romeo’ – hardly a good name for an immigrant boy in early 20th century USA where ‘men were men’. So, he changed his name to something unquestionably masculine and ‘rugged’ – Ralph. Except for the first letter, it has nothing in common with his original name. Some people changed their name simply because they didn’t LIKE their birth name. My great-aunt Rustica Fausta Onorati changed her name to ‘Lena’, solely because she hated the name Rustica! Unless you happened to know her birth name was actually Rustica (fortunately, I did), you would never find her in the parish records, as the two names bear no similarity to each other whatsoever. TIP: I often come across family trees where a person is listed under their ‘adopted’ name rather than their birth name. Personally, I find this very confusing, and I think it can lead a researcher down many dark alleys. I believe it is always best practice to use the name a person was given at birth, and cite any aliases or name changes in your notes about that person. On Ancestry.com, for example, you can write these aliases in a field called ‘also known as’. You can also put them in the ‘person notes’ in software programmes like Family Tree Maker. These days, many parents go out of their way to find unusual names for their children. But most of our ancestors were named after elders – parents, grandparents and great-grandparents on both sides of the family. Knowing this can often help you identify family groups more easily when searching through old records. Just this week, my brain was going into a twist when I was trying to figure out which of two men named Eleuterio Parisi (born about the same time in the same village) was my 9x great-grandfather. The definitive clue was in the names of his children: his eldest son and daughter were named after his parents, Pietro and Maria. This practice of keeping names in the family can even help you identify the order of children, as the first son was frequently named after their paternal (and, in some cases, maternal) grandfather. Another common practice was to name a child after a family member had recently died. Sometimes this person was a wife of the father who may have died shortly after childbirth. I have seen many instances where the first daughter of a second marriage is named after the deceased first wife. The deceased person could also be an older sibling. If you see a couple with three daughters named Margarita, it means the first two died in infancy or early childhood. My 2x great-grandfather was the fourth Matteo in his family, having had three older brothers, all called Matteo, who died shortly after they were born. In fact, of their 14 children, no more than 6 (and possibly only 3) of them lived long enough to have children of their own. Family group sheet of Alberto Serafini and Margherita Giuliani. Most of their 14 children died in infancy. My 2nd great-grandfather, Matteo Luigi, was the only one of 4 ‘Matteos’ to survive to adulthood. This brings up another important tip: if you find a birth record with the right name and parents, don’t immediately assume it is your ancestor. Keep looking ahead to locate the births of all children of that family, to see if there is a later child with the same name. Something you might find amusing is that you occasionally see names that indicate which number this child was in the family. For example, boys’ names like Primo, Secondo, Ottavio and Decimo would indicate they were the first, second, eight and tenth born, respectively. While you might find these names less than ‘inspired’, they can be great clues in your research. Spelling? There’s NO Such Thing! See the previous article on surnames for a few general rules of thumb on how spelling can vary. IMPORTANT: Always remember that variations in spelling do NOT indicate different people. The same woman might appear as ‘Isabetta Rochi’ in her birth record, but as ‘Elisabetha Rocche’ in her marriage record. If you work with parish records, you will discover that nearly ALL first and middle names tended to appear in their Latin forms until the 19th century. What’s interesting is that many Latin names actually look like English. You’ll see Joseph (for Giuseppe), Anthony (for Antonio) and Jacob or Jacobi (for Giacomo). Some Latin first names resemble German names, such as Johannes or Johann (for Giovanni) or Joachim (for Gioacchino). You’ll also see some fabulous old names like Hieronymus (for Girolamo) and Aloysius (for Luigi). When looking at 19th century records, you might start to see the shift from Latin to Italianised spelling. For example, I’ve seen many an ‘Aloisio’ in early 19th century baptismal records who was later listed as ‘Luigi’ on his marriage record. If you’re not aware that this could be the SAME name (and same person), you might miss the record altogether. Before the 18th century, middle names were not commonly used, except in the case of noble families (which were more common than you might imagine). Later, especially from the 19th century onwards, giving a child one or more middle names became a more widespread practice. While the shift towards using middle names was probably seen as a practical means of distinguishing one person from another, it’s my belief that it was also a reflection of the shift in worldview spreading throughout Europe from the end of the 18th century, when beliefs about the importance of the individual and personal expressiveness were becoming increasingly popular. In our modern, English-speaking culture, middle names are often seen as ‘extra’ names. But for the Trentini genealogist, middle names are extremely important when constructing your family tree, because some people come to be known exclusively by one of his/her middle names. For example, everyone in my family knew my great-grandmother as Europa. If you look at her marriage record, she is called Europa. If you look at her children’s birth records, she is called Europa. But if you try to look up Europa Parisi in the birth records, you won’t find her. Why? Because her birth name was Domenica Filomena Europa Parisi. That’s a mouthful! 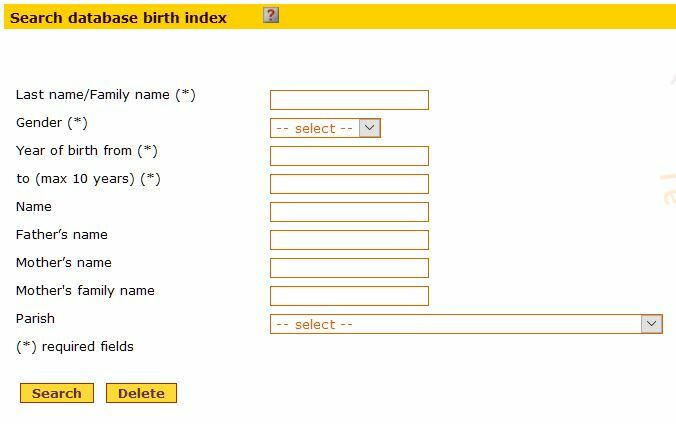 Sometimes, you might know the name of the parent of a child, but you cannot find the parent’s birth record anywhere. A few weeks ago, I spent four hours looking for a man named Pietro, who was the father of about 10 children. After trawling through every possible baptismal record, I concluded that his birth name was Giovanni Pietro. I’ve also seen many instances where a child’s baptism was registered in more than one parish, and the first and middle names were recorded in a completely different order in each of them. When such a thing happens, how can you possibly know which one is THE name of the child? The truth is, you can’t. Sometimes the priest will give you a clue by UNDERLINING the name by which the child will be known. But unless he was insightful enough to do this, you’ll find yourself without a clue of how this child came to be known until you dig further down the line to find their descendants. Also, if you are using transcriptions for your research, instead of images of the original parish records, you will never even be aware the priest underlined the preferred name (unless the transcriber was very thorough). If you work with parish records, you will also encounter many abbreviations of first names. Sometimes these are just shortened versions of the name, such as Bortolo for Bortolomeo, or Gianbatta for Giovanni Battista. But other times, you will see actual abbreviations. You will frequently find Francesco and Domenico written as Fraco and Domco (‘co’ in superscript), and Francesca and Domenica as Fraca and Domca (‘ca’ in superscript). Similarly, Antonio will be abbreviated as Anto (superscript ‘o’) and Antonia as Anta (superscript ‘a’). Needless to say, you have to read very carefully to make sure you’re looking at the record for a male or a female. One very common (but rather odd-looking) abbreviation is ‘Gua’, which stands for Giovanni. To make things even more confusing, you’ll see Latinized names abbreviated, such as Jo. Bapt for Giovanni Battista, or Domcus (‘cus’ in superscript) for ‘Domenicus’ instead of Domenico. TIP: The words ‘figlio’ / ‘filius’ (meaning ‘son’) and ‘figlia’ / ‘filia’ (daughter) are almost always abbreviated as figo / figa, fils / fila or simply fo / fa. Baptismal record from 1708 of Domenico Antonio Salizzoni of Cares in Bleggio. The priest has used Latin abbreviations for his first and middle names (using ‘cus’ in superscript), and Salizzoni is spelled with only one ‘z’. The word ‘filius’ (‘son of’) is abbreviated with ‘s’ in superscript. Being familiar with the names of the various frazioni (the tiny hamlets) in which your ancestors lived is also crucial to building your Trentini family tree. In a later article, I’ll talk more about frazioni and how they are tied to our ancestral roots. But for now, as we’re talking about first names, it’s relevant to mention that all parishes – and most frazioni – have their own church, and every church has its own patron saint. It is not uncommon to see many people in a particular frazione or parish with the same first name because they are named after their local patron. For example, you’ll see a lot of boys named Felice in the frazione of Bono in Bleggio, where their patron is Saint Felice. Giustina is a common girls’ name in the frazione of Balbido (also in Bleggio), where Saint Giustina is the patron. On a parish-wide level, the boys’ name Eleuterio was extremely common in Bleggio during the 1500s, as St. Eleuterio was one of the patron saints of the parish at that time (the parish was not known as Santa Croce until after 1624). In the parish of Saone, I recently discovered a glut of boys named Brutius (Latin for Brizio), as their local patron is Saint Brizio. The 14th century church of San Felice in Bono, Bleggio. Aside from village patrons, there are also patron saints for specific days. I came across a record for a Giorgio (George) who was born on April 23rd – the feast day of Saint George. I have seen more than one Giuseppe Maria (Joseph Mary) born during Christmas week. I also found a girl named Epifania born on the day of the Feast of the Epiphany (January 6th) and many baby girls named Pasqua around Easter time (Pasqua means Easter). Being aware of the various patron saints can help you understand why your ancestors may have been given their specific names. If you really want to find out who you are, it all starts with the names of your ancestors. Far more than simple designations, these names are drenched in meaning, culture and history. If you’re like me, sometimes you’ll find a particular name that draws you in and gets you really curious. Sometimes, you’ll find yourself loving this great-great-great-grandparent because of their wonderful name. These emotions are what give genealogy the power to connect us with our past and transport our ancestors into the present. If you haven’t yet started to trace your Trentini ancestry (and all the other ancestral roots you might have), I encourage you to make a start. Next time, I’ll be giving you tips on finding your FEMALE ancestors from Trentino. Finding your great-great-great-great-grandmother is not always as straight-forward as you might think! Drawing upon my own research for the ‘One Tree’ project, I’ll be sharing some of my very best ‘genealogical detective’ strategies for finding all the wonderful women who contributed to your DNA through the centuries. I do hope you’ll subscribe to Trentino Genealogy blog (see the form on the top-right side of this page), to receive that and all future articles on this site. Until then, I look forward to reading your comments or questions about this article below. And if you have any comments OR questions about Trentini genealogy, I cordially invite you to drop me a line via the contact form on this site. Born Romeo Fedele Serafini in 1919, my dad’s name changed to Ralph Serafinn around the time this shot was taken in 1937. Genealogist Lynn Serafinn shares tips for researching your Trentino family history, and tells what you need to know about your ancestors’ surnames. When it comes to family history, all research springs from one thing: a NAME. Our Trentini ancestors had wonderful names – rich in meaning, culture and history. Having a solid understanding of the names of Trentino is crucial to constructing an accurate picture of your family history. That’s why, over the next few articles on this blog, I’ll be looking at some of the idiosyncrasies of our ancestral names so you can more easily identify your ancestors in historical records, and have a better understanding our colourful heritage. In today’s article, we’ll be taking a look at cognomi – surnames. SIDE NOTE: I’ve made a searchable database of Trentini surnames on this site. CLICK HERE to view it and see if your surname is currently on our “One Tree” project family tree. The first thing to remember is that many of our ancestors who immigrated to the Americas changed their surnames to make them sound less “foreign”. Surprisingly, some descendants might not even be aware this change occurred. Such was the case with me. When I was growing up, neither I nor many of my cousins knew our family name was actually Serafini. But after my dad died, I discovered our original name when I started digging into our family history. I even found the official change of name request my grandfather had filed in the 1930s. This meant that my dad had been known by the surname Serafini until he was in his late teens, but (for reasons unknown) he chose not to tell me. It was a bit of a shock to discover that something I had been told since childhood was an untruth. Be prepared for the possibility of unearthing a few of your own skeletons as you do your research! Prior to the 18th century, surnames were still in a state of evolution, and your surname will probably look very different the further back you go in time. One example is the surname Gusmerotti. This name is likely to be written as Gosmero or Gosmeri in records from the 1500s and early 1600s. This is because Gusmerotti comes from the masculine first name Gosmero plus the suffix -otti (meaning large). Another example is the surname Devilli. Prior to the 19th century, you will typically find it written as either “de Vigili” or simply Vigili. The term “vigili” refers to someone who keeps guard. As a name, it was first used to refer to specific branches of the military during the reign of the Prince Bishops. Thus, knowing the origins of your surname can sometimes give you a clue as to what some of your ancestors did for a living. Until the late 18th century, Latin was the language used in Trentini parish records, rather than Italian. While this practice was nearly always used in the spelling of first and middle names (which we’ll explore next time), it could occasionally also alter the spelling of surnames. One example is the surname Onorati, which was frequently written in its Latin forms, Honoraty, Honorati or Honorato. 8 Feb 1596. Baptismal record of Francesco, son of the noble Valerio Honorato (Onorati) of Bono and the lady Giustina. Santa Croce del Bleggio parish records. Even after modern surnames began to “stick”, there was no concept of standardised spelling until relatively recently. For example, the surname Caliari can also appear as Calliari, Cagliari or Caliary. Along the same lines as the Devilli example above, any kind of “conjunct surname” (one that was originally two separate words) could appear either as a single word or two separate words. For example, the name Daldos might show up as Dal Dos or Dal Doss. This flexibility means it is not uncommon to see different surname spellings in the birth, marriage and death records for members of the same family (or even for the same individual). So, it’s important to remember that variations in spelling do not normally indicate the person is from different family, as it would in modern English-speaking culture. SIDE NOTE: Research become even more complex when you add to this the plethora of variations you will see in first and middle names (which we’ll look at next time)! When researching your female ancestors, you need to remember that women in Trentino do not take their husbands’ name when they marry, but retain their fathers’ surnames throughout their lives. So, when researching your female lines, don’t try to find them under their husbands’ names, as you won’t find them. Also, if you use software for your family tree, make sure it is set so it doesn’t automatically change the women’s surnames to their husbands’. Lastly, it’s worth mentioning “sopranomi” (plural). A sopranome (singular) is an add-on or nickname sometimes given to one branch of a family to distinguish it from other branches. While saying “Giovanni son of Giovanni” can help distinguish that person from “Giovanni son of Pietro”, sometimes there are just too many Giovannis to know who is who. That is where a sopranome can be useful. For example, the branch of the Serafini family from which I am descended was given the sopranome “Cenighi”. This sopranome was chosen because Margherita Giuliani, the wife of my 4x great-grandfather Alberto Serafini, came from the village of Ceniga in Drò parish. For the genealogist, a sopranome can be a blessing OR a curse. You might come across a baptismal, marriage or death record where the priest used ONLY the sopranome, omitting the person’s surname completely. When that happens, if you don’t know the sopranome (or you’re not paying attention) you might accidentally gloss over the record you’re looking for. I hope this article has got you interested in knowing more about all the wonderful Trentini surnames that make up your heritage. If you’d like to dive more deeply into the subject, there are many excellent books available in Italian. One I use almost on a daily basis is Guida Cognomi del Trentino by Aldo Bertoluzza. Next time, we’ll be looking at things every family historian needs to know about our ancestors’ first and middle names. If you subscribe to Trentino Genealogy blog (see the form on the top-right side of this page), you’ll be sure to receive that article via email, along with all upcoming articles. Until then, I look forward to reading your comments or questions below. And if you have any comments or questions, I cordially invite you to drop me a line with me via the contact form on this site.